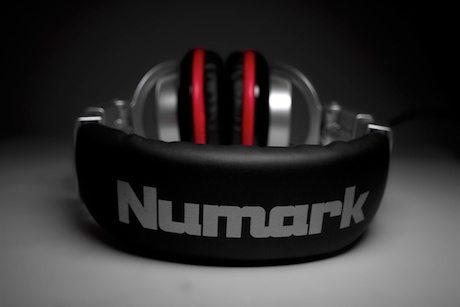 Numark have played it quite safe with this pair, but have added their own splash of brand ID with the obviousl flash of red, which I assume is designed to match the NS6 and NS7 controllers. But they're not just some cosmetic accessory - they're pretty good for the cash. Anyhow, I say all I need to in my review. And do feel free to check out the rest of the group test too. As much as I like Numark gear I would never buy these because of the swivel joint. They are just like every other cheap plastic swivel joint seen on many other brands of headphones... they break too easily! Also, what's with the trend of straight cables? Straight cable = asking for trouble. @Dizzy: Please explain " Straight cable = asking for trouble" because I find the exact opposite to be true. In my experience, coiled cords = kinks and knots, especially when heavy gigging and stored in gear bags. Straight cords on the other hand (quality ones of course), wind very nicely in a clean circle loop and never kink or knot up (just like quality mic cords). Jack - Maybe it's their logo? Anyways, I've had this set for a while now, they've held up great. Good sound, and like your review says, great value for your money. I used to swear by coiled cables for cans. Mainly cause I'd leave them around my neck while ducking down to dig for vinyl in my crates. After converting to Serato Scratch Live about 5 years ago, I don't really care that much. As this I have all my music right there on my mac, I can still reach while wearing them around the neck, even with a straight cable. However, if I decide to dance around in the booth I'll have to take them off. My main pair is Sennheiser HD25 with straight cable, the backup set is also Sennheiser HD25 with a coiled one. Red Waves are good cans for the money ... As for the 45 adapters I like 'em. Kinda of nostalgic for an old school-er like me.